Although little girls who love the color pink and frilly dresses and those who prefer wearing jeans and climbing trees are very different in some aspects, they do share a common bond – the love of owning a jewelry box. When growing up, you probably owned a special box where you stored all your favorite treasures. If like many women, you may still own this jewelry box and perhaps even use it, if it has not already been passed down to a niece of daughter. For years, the most common type of girl’s jewelry box was white with pink silky lining. Now, if you were fortunate enough, you might have owned a fancier jewelry box that featured a dancing ballerina on top accompanied by soft music. Of course, that very style of box is still manufactured and sold today but as with everything, times have changed. As a result, little girls now have many more options when it comes time to choose a first jewelry box. Yes, the original style of girl’s jewelry box is still available but we wanted to mention some of the newer styles that you could consider for your favorite little girl. Remember, boxes are not only different in appearance but they are made with a variety of different materials, they come in a wide selection of designs, and most even boast special features that only little girls would appreciate, especially if they want to keep things hidden from a sister or brother who loves to snoop. o Tall Jewelry Box – A take on the white jewelry box with silky pink lining from the past is one that stands 12 inches tall, perfect for a dresser or nightstand. 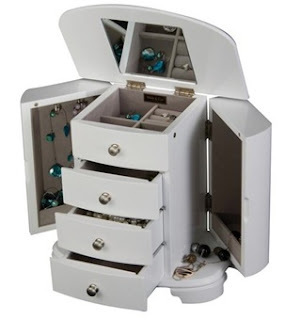 Made from wood and painted white, this jewelry box has gracefully sculpted legs, five pull out drawers, two swing-out side doors for necklaces, and a lid that opens to reveal a place to store rings, pins, and other smaller items. This little girl’s jewelry box also has a mirror under the lid that makes getting “dressed up” easier. o Ballerina Box – For a little girl who wants the dancing ballerina and music that was so popular during the 1960s, the carousel egg with horse would be an excellent option. Literally shaped like an egg, a beautiful carousel horse takes the place of the dancing ballerina. While there are a number of songs, “My Heart will Go On” from the movie Titanic is a great choice. Adding to an already gorgeous design is the white background with a hand painted gold, purple, pink, and blue design that any little girl would love. As an adult, you probably own a jewelry armoire and if you are a mommy, chances are good your little girl would love nothing more than mimicking everything you do. Obviously, a full-size jewelry armoire would be much too large and expensive but you could purchase one designed just for little girls. Following are two of the many design options you might consider. o Oak Finish – This particular jewelry armoire is unique from others but still the perfect fit for a little girl who likes things “outside the box”. The combination of traditional and modern design coupled with brushed nickel hardware and ivory suede fabric lining are key reasons this has become a top seller. Inside the lid is a compartment for rings and open storage space but also a handy mirror. Other popular features include two swing-out necklace doors with six hooks and catch panels each, four pull out drawers, scalloped front apron, and cabriolet legs. o Classic Floor Armoire – We also wanted to suggest this as a little girl’s jewelry box, which is simply stunning yet age appropriate. The box is classic white, hand lined with ivory suede fabric, it comes with hardware and drawer pulls made from antiqued brushed pewter, and the legs are square and tapered. Additional things that would make this ideal for your special girl includes the top lid with central ring roll, six open sections, and interior mirror, four pull out drawers, two swing-out necklace doors, and a perfect height of 13.5 inches! What Jewelry to Buy the Lady who has everything?